Award-winning existential drama laden with dazzling ideas and images, which follows a young physicist in his search for meaning in life. He thinks science will provide the answers, but ultimately learns far more about himself through experiencing love, betrayal, loss, and facing his own mortality. - Presented from a superb new high-definition restoration of the film, approved by the director. - Newly filmed, exclusive interview with director Krzysztof Zanussi. 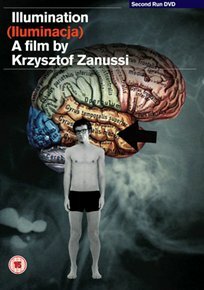 - A Trace (Slad) – Marcin Latallo’s acclaimed 1996 short film about his father, the lead actor in Illumination, Stanislaw Latallo. - Booklet featuring a new essay by film critic and author Michal Oleszczyk.